Travel with Kevin and Ruth! : Four more sleeps! Well, we're into the final stretch. Only four more sleeps and it's on to new adventures. But there's still a lot to do here over the next four days. I've got four of the five washrooms winterized, and I'll do the final one today. I've got part of the beaver fencing up, and I'm trying to do a little every day rather than doing it all at once like I've done in the past. Much better this way! And I have to change the oil in the machinery and get it all cleaned up. Monday morning we'll shut off the water and I've already made the appointment to get the big compressor down here so we can blow the lines out... and then we're gone. Boy, you can sure tell that fall is in the air! It was only 4C (39F) when we woke up this morning, and they're only calling for a high of 11C (52F) today. Going to have to wear my winter hat working outside today! Down to 1C (34F) tonight! Had a really fun evening hosted by the park board of directors. This has been a great place to work for the last four summers, and the people on the board have always been really supportive. They put on a great dinner for us, and it sure feels good to be appreciated. Everyone enjoying snacks and a glass or three of wine! Lots of food and drink! Mayor David, handing out the ribs! Great food, and lots of laughs. What a good bunch of people. Almost too much fun though. I woke up with a minor headache! Too much red wine! There's no more people around so it doesn't take long for the wildlife to move back in! Great deal on remote controlled LED string lights! I remember arriving at the park as well back in 2014 and looking around at all the things that we wanted to accomplish. We are happy to say that we got some of them completed and definitely feel like we are leaving the park better than we found it. We sure hope that the next managers care for the park like we have. It was very nice of them to do that for us! Kevin will have to take a picture of the beaver fencing. It is a must have here or the beavers will attack and cut down our trees! Nice to have a show of support, and a party with food and drink! Time to move on, though, as we say. You'll be going to the island soon? I hope everything works out for you. Hard to imagine your cold temps when we're sitting in 90+ degree temps (and wishing they'd go away!!!). It sure was nice of them and shows that our work never went unappreciated. They also tried their best to get us to change our minds and stay another year. They are a great bunch of board members and made us enjoy our work all the more. You did a great job at the park! Congratulations!! Looking forward to where your future travels will take you. 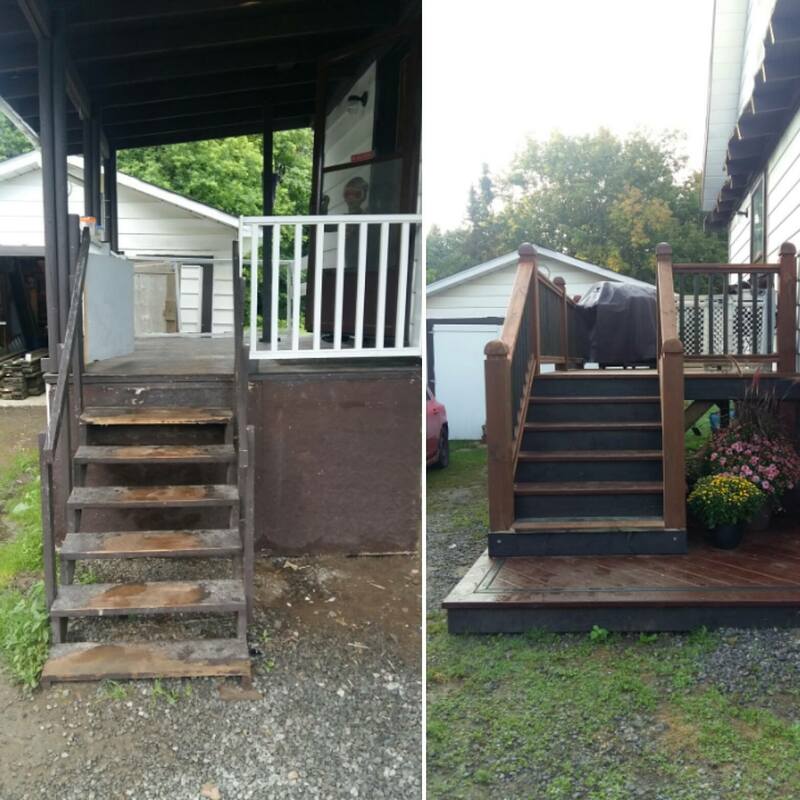 What a difference in the before and after porch pictures - nice! Justin is a great carpenter, their house will look amazing when they actually get it all done. Happy for your new adventure! Who will be taking over the park now that you are gone for awhile? Sounds like you both did an excellent job running it. Nice to be appreciated! Have fun on your new adventure! We have no idea at the moment. The board will be putting out an ad at some point looking for people interested in the position. Off topic, but here's a fascinating story of RVers recruited by Amazon to work Christmas seasons at their warehouses. That definitely is quite the story. Too bad working on Amazon's Camperforce is only for Americans though. I am sure that a lot of Canadians would also be interested in something like that. Well that was a busy 24 hours! We are now carless, for the first time ever! The little blue car is gone! We made a campground reservation! Chilly mornings and more blog reading visitors! The little blue car is for sale!